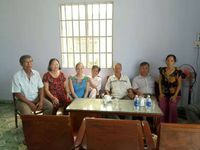 The author with a few of her mom's brothers and sisters after meeting them for the first time during Tet. Photo courtesy of Stacy Dahl. 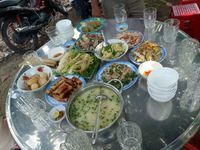 A Tet feast at a relative's home in Cu Chi. Photo courtesy of Stay Dahl. The first house I stepped into once we arrived was one of my uncles', and it was where my other aunt was waiting for me. When she saw me her eyes lit up and a smile filled her face. She pointed to her eyes, nose and mouth and said something in Vietnamese. Although I couldn’t understand the language, I already knew that she was telling me that I have the same eyes, nose and mouth as my mother. On my final day in Saigon, I felt heartbroken. In the short amount of time I had spent with my family, I had grown to know and love them. During the taxi ride to the airport from Thanh’s house, I cried bittersweet tears of goodbye. One phrase that he had taught me during the trip that really stuck with me was “Hẹn gặp lại,” or "see you later." This is what I told my family members as I said goodbye because deep down I knew I’d be back very soon. - Born in California, a Vietnamese-American Returned to Vietnam. This Is What She Saw.